Here’s a question for all of your parents of teens and tweens: How often do you get cash out of the ATM for your use only to find it gone before you had a chance to spend it? It’s definitely happened to me dozens of times. Every time I turn around, KitKat needs some money for lunch with friends, a movie, a trip to the mall, a new pair of jeans, etc. KitKat is 14, a freshman in high school, and does not have a job, though she’s working on that. She babysits for me all the time, but rarely gets asked to babysit for other families (it seems to be a trend in this area. We’ll blame it on the economy). She needs money, but I don’t always have cash to give her. The past few years have been rough for us financially, so I never considered looking into any type of credit card for my teen. 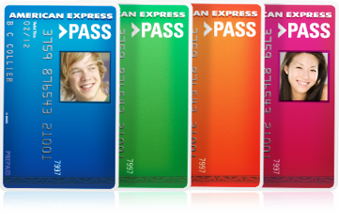 It wasn’t until I was approached about reviewing the PASS card from American Express that I researched the options for parents and teens. Parents load it. Add money to the card from an American Express or a bank account any time, any day. Teens use it. The card can be used online and at millions of stores, restaurants, theaters, etc. Both track it. Teens and parents can both log in to check the PASS Card balance, view transaction history and set up alerts. I can set aside a certain amount of money for KitKat, load it onto the card and know that we can budget together. The customizable card. I picked a green card and uploaded my blog’s candy picture onto the front. I secretly want it for MY wallet. I can track purchases and know exactly where her money is going. My daughter (who will be going off to college in just a few years) is getting experience with a “credit card”-type card that will not hurt her credit. I love that she won’t have to take money from my wallet (though the rest of the family will continue to that, I’m sure). The funds are safe even if the card is lost. Not so with cash. No risk of overdraft or extra fees like that. There is a monthly fee ($3.95 per month), though the fee is waived until October 2011. I could only load money from an American Express card or a checking account (I was hoping for a Paypal transfer). The package that the card was shipped in was enormous for a simple card and start up guide. A big waste of cardboard. Despite the few negatives, I really did feel that the benefits outweighed the things I wasn’t happy with. I think that the PASS card is a great option for teens and parents. If you have older kids, teens or tweens. and you would like to try the PASS card out for yourself, PASS and SheSpeaks have an offer that’s hard to pass up. Open up a new account with PASS, load $25 onto the new card, and SheSpeaks will load an additional $25 onto the card for you. All you have to do is enter the promotional code SS25 when you open the new account here. The best part of this is the fact that this is not a giveaway… Every one of you is a winner. That’s $25 of free money. Don’t have a teen? Get a card for yourself. Now, I would love to hear YOUR experience with teens and money. If you have a teen, how do you handle giving them money to spend? If you don’t have a teen yet, tell me how your parents handled money when you were a teen. I’ve got 4 more kids who will be entering the teen years sooner or later, and I can use all the advice I can get! Disclosure: I opened up a PASS account on my own and loaded $25 onto the card. However, I was compensated for taking the time to review the card with some additional funds being added to the card after activation. The thoughts and experiences in this post are my own. The PASS card from AMEX is an absolute joke! We got a card for our 16 year old daughter for all the same reasons you mentioned above and their claims that in the event that the card is lost, stolen or has fraud activity, they would restore the card immediately. My daughter used it at a local merchant on Saturday and the clerk was confused by message from AMEX. They called AMEX and AMEX told them there was an 8 day hold on account (on a prepaid card?). Merchant sent my daughter home without purchase only to learn that card had been charged. The call center in India and the Executive office said there is nothing they can do to reverse an “authorization” and we simply need to wait 8 days for the transaction to reverse. ARE YOU KIDDING ME!? I have been an AMEX card holder for years and I am canceling all of my accounts with them because of their bogus product. Don’t use this card! It does not do what it claims to do. Cash is better! Your pros and cons lists are exactly the same as mine! I uploaded my baby daughter’s picture on it, I *love* pulling it out to use. I’ll have to look into that. I got my 15 year old son a paypal debit card, which is attached to my paypal account. For pretty much the same reasons, and I wanted him to get some experience before he turns 16 in Nov and gets his own checking account. Also with him starting to drive, he should always have $$ for gas or at least I can get him $$ quickly. Pass Card american express is usefull to every citizen in america.